If there every was a SuperMom, it would be my Mom. My sisters follow closely in her footsteps, but nevertheless, my Mom is da bomb! If your Mom is anything like my SuperMom, she deserves to be pampered. Mother’s Day 2016 is less than 7 days from today. What is your hotel offering? 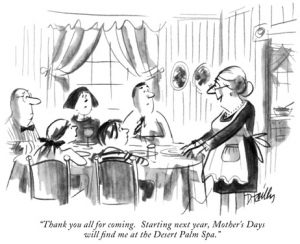 Are you celebrating your Guest Moms? What about your Employee Moms? Whether she is a Road Warrior Mom or a Stay At Home Mom, this is her day and we need to honor, pamper, and spoil all these special women. Some of our hotels are doing weekend specials, some have pampering baskets available in the market. What are you doing? Call around the area and see what is going on in your competitor’s hotels. Get a list of local activities and try to cross-promote. If you haven’t already started promoting and selling your packages and promotions, what are you waiting for? Set up a SuperMom Selfie Station with a frame, selfie stick and your hotel logo near the front desk for people to take souvenir pictures. Have them hashtag your social media pages. Mother’s Day is the #1 Dining Out Day of the year. Negotiate with a local restaurant to offer a discount to your SuperMom Guests when they present their key card. Have a selection of food delivery options for stay-in-for-the-night SuperMoms. If you and your siblings are traveling home for Mother’s Day, schedule a portrait session and give Mom a lasting gift for display in her home.